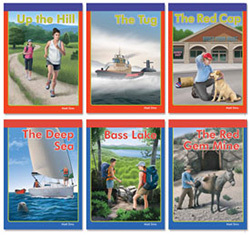 Each book in the Sound Out series is written in chapter format with stories that have the charm and wit to keep kids coming back for more. Sound Out Chapter Books give students numerous opportunities to practice decoding one-syllable and simple two-syllable words. Set A includes six books, three of which focus on short vowels and three that focus on long vowels. Students with minimal reading skills can read these books from cover-to-cover. They'll have a successful and enjoyable reading experience with lots of decoding practice. Workbook contains story synopses and pre- and post-reading activities. Helps students build vocabularies, practice comprehension, recall and other basic reading competencies. Includes answer key. Reproducible. 8 1/2x11 softcover, 56 pp. Sound Out B-1 and Sound Out B-2: Same skills taught in A-1 and A-2 with the addition of practice with consonant blends and digraphs, diphthongs, controlled vowels, and silent letters. Sound Out C-1 and Sound Out C-2: includes skills taught in Levels A and B, and adds inflectional endings, compound words, prefixes and suffixes, and regularly spelled two-syllable words.